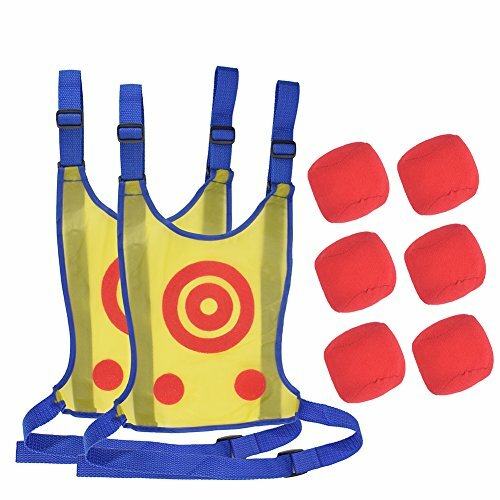 OUTFANDIA 2 Pack Kids Dodgeball Tag Sticky Vest Set Outdoor Throwing Target Game with 1 Sticky Target Vest & 3 Handballs by OUTFANDIA at Scruffs Game. Hurry! Limited time offer. Offer valid only while supplies last. PREMIUM MATERIAL - Made of Nylon & PA, this dodgeball vest set is comfortable, durable and safe for kids playing. 2 SET - Sale for 2 pack. Each dodgeball kit includes an air-mesh vest and 3 soft dodge balls. Lightweight, easy to carry. HAPPY PLAYING - One player throw the ball and the other player catch the ball with the hook and loop on the shirt and let your kids enjoy the fun of tossing and catching. ADJUSTABLE DESIGN - With safety buckle design, you can adjust the vest to fit you most. BENIFIT - Perfect game for developing hand-eye coordination, dexterity, coordination agility and confidence. SUITABLE FOR KIDS ABOUT 3-6 YEARS OLD. If you have any questions about this product by OUTFANDIA, contact us by completing and submitting the form below. If you are looking for a specif part number, please include it with your message.